Charm in abundance at this colourful Puglian country house close to the Adriatic's sandy beaches. Arrival at Lamia Bianca is a polychromatic feast for the eyes: the clean white façade is interspersed with lavender blue shutters, the lush green lawns contrast with the sparkling azure waters of the Adriatic, and a flush of bright pink bougainvillea completes the quintessential Mediterranean palette. Inside: accommodation at Lamia Bianca is spread over two buildings. The main house, accessed from the sea view courtyard, is home to a cosy, bright living area, with high vaulted ceilings and stone clad flooring, two original elements that are repeated throughout the rest of the house. From here we move into the small, but well-equipped and functional kitchen with dining table and access to the delightful walled courtyard garden and al fresco dining area. A door from the kitchen leads to the sleeping area, comprising a double bedroom with en-suite shower room and a double-twin with adjacent shower room. Both bathrooms have sunken showers, reached via a couple of steps. Just across the sea-view courtyard is the light, bright, dependence, which houses the third bedroom, complete with en-suite shower room and views of the sea. Outside: outdoor living is what Lamia Bianca really excels at! There is a wonderful variety of areas in which to relax, snooze, dine, recline and have fun. Between the main house and the dependence, is the large sea view courtyard, flanked on either side by trees, shrubs, lawns and low dry stone walls. Here, just outside the dependence, there is a shady lounge area and wood-burning pizza oven. An arch by the side of the main house leads to the delightful walled garden, divided into a lawned area with trees and an idyllic, shady al fresco dining area, also accessed from the kitchen. From here another arch leads to the walled pool area, featuring a sensuously curvaceous pool with the added bonuses of a shallow paddling end that is ideal for younger children and a hydromassage corner (ideal for adults!). Last, but certainly not least is a shady lemon grove. The sunken showers are accessed via a few steps that may not be suitable for anyone with mobility problems. The countryside surrounding Lamia Bianca, from the sea, 6km to the east, to the rolling hills of the Valle d'Itria in the west, are carpeted with gently whispering olive groves that produce some of the world’s finest olive oil. Sea front Savelletri, with its shops, bars, restaurants and beaches, is just a 10-minute drive away. Heading inland, you will soon reach delightful the Valle d'Itria and its charming towns: Alberobello, Cisterino, Locorotondo and Ostuni. All have regular markets, as well as a selection of typical bars and trattorie. An extremely attractive feature of Lamia Bianca is that guests may visit chic beach clubs, spa and golf courses nearby. Just up the coast (20 mins drive) are the lovely seaside towns of Monopoli and Polignano a Mare, while slightly further afield are the Baroque centre of Lecce and the stunning walled coastal towns of Otranto and Gallipoli. "Really liked the style of the property." Lamia Bianca is lovely holiday villa, a delight. The outside spaces provide places in the shade for socialising, eating, reading or quiet reflection as well as the lovely private pool where the sun can be enjoyed between cooling dips. Lamia Bianca is a great place. The swimming pool worked well with young kids due to the large shallow end. Loved the almond and lime trees. Spectacular sunrises and sunsets. Lamia Bianca worked very well for our family of 3 adults and 2 children. We enjoyed greeting our hardworking neighbours and their children as they worked their vegetable fields. Lamia Bianca was very well equipped with everything you could possibly want. In particular the standard and cleanliness of all facilities and in particular that of the the baby equipment was much appreciated. Lamia Bianca is amazing and we love Puglia. We loved it. Great home, location and experience. The toddler area in the pool was a standout. 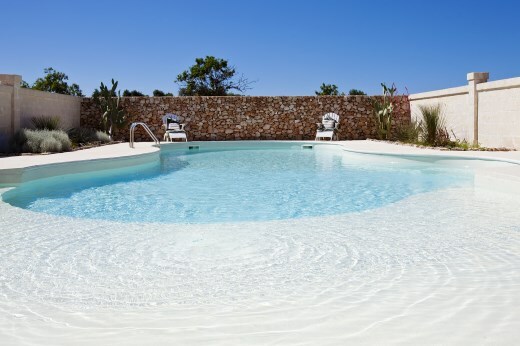 Lamia Bianca is a lovely villa, accurately represented by the website photographs. Very much enjoyed our stay. The villa was very comfortable to hang around in even with three small children. We will have to visit again in the summer! Really liked the style of the property. Lamia Bianca was good for its proximity to sea, restaurants and golf. Easy to get to from the airport. Put simply - we had the perfect family holiday. Lamia Bianca was wonderful and completely exceeded all of our expectations. The house was beautiful, spacious and really well-equipped. Because of the spaciousness of the villa and its grounds the entire holiday went beautifully for three generations of family. Not a bad word to say - it was a fantastic holiday. It was immaculate, clean, beautiful and comfortable. It had everything we need it to make our stay perfect. We are very happy with our holiday and we have already recommended you to our family and friends. We didn't have any complaints. I really did enjoy the peace and quiet of the villa surrounding. Wonderful holidays... The owner was very helpful. The property was incredible. Spotless, well stocked - going so far as to include treats for the children. The owners had thought of everything... It was impossible not to relax. Lamia Bianca offered many different areas to explore. The house was beautiful but we spent very little time inside, as the outside was so inviting. Definitely worth every penny.